Heat 12-inch skillet over medium-high heat. Add pork, gingerroot and garlic; cook 8 to 10 minutes, stirring to break up chunks, until no pink remains; drain, and return to skillet over medium heat. 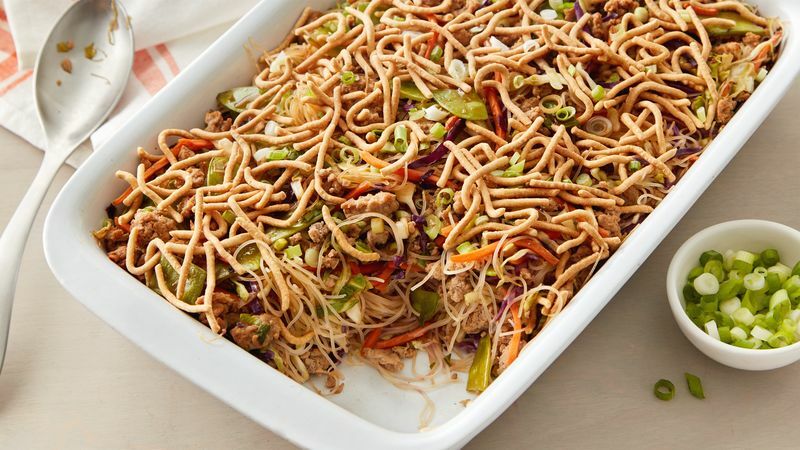 Stir in coleslaw mix, pea pods, shredded carrot, 1/4 cup of the green onions, 1/4 cup of the teriyaki glaze, and the soy sauce; carefully toss with tongs until blended. Remove from heat, and place in large bowl. Meanwhile, in 4-quart saucepan, heat broth and Sriracha sauce to simmering. Add rice stick noodles; reduce heat to low, and cover. Note that noodles will not be completely immersed in liquid. Cook 2 minutes; stir to moisten noodles. Cover and cook 2 minutes longer; remove from heat, and let noodles stand 1 to 2 minutes, stirring occasionally, until all of the liquid is absorbed. Add noodles to bowl with pork mixture; toss gently with tongs until completely mixed. Spoon mixture into baking dish; cover with foil. Bake 20 to 22 minutes or until heated to 165°F in center of casserole. Drizzle with remaining teriyaki glaze; top with remaining green onions and the chow mein noodles. Ground turkey can be substituted for ground pork in this recipe. Just add 2 teaspoons of oil at start of recipe, and proceed as directed. If you like it spicier, increase Sriracha sauce to 4 teaspoons.